This story starts a little over a hundred years ago in the land of New Zealand (Aotearoa). 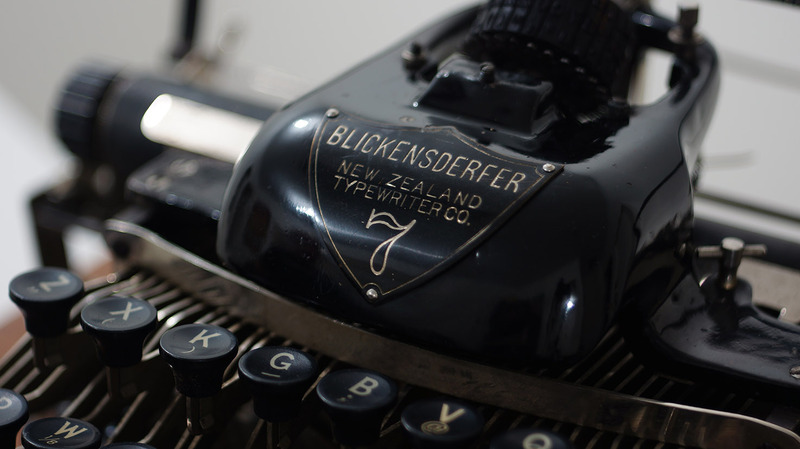 With streets lined with bluestone and sandstone buildings along roads congested with horses and dirt, there was a little typewriter for sale in a shop in the city of Christchurch. A gentleman by the name of Francis Burdett-Sapsford may have been busy beavering away at repairing a racquet that belonged to one of the more leisurely locals when he sold it. Francis made a living out of these repairs, as well as also an importer of renovation materials along with selling office equipment to the locals. A sign in front of his building proudly announced that he was an authorised agent for Royal Barlock Typewriters, but he also carried a stock of another kind of machine that had become popular in New Zealand – popular enough that they the country had machines badged specifically for their market. The Blickensderfer New Zealand – up close and personal. Sometime in 1909 this machine graced mr F Burdett-Sapsford’s counter for only a brief moment of its life before being carried off into the countryside where it would would do who-knows-what for the next century. At some point it travelled to Australia and then ended up in Melbourne. It turned up recently on ebay – where it also was only briefly seen before someone clicked the ‘Buy it now’ price (a double digit price at that…. no, seriously!) instead of bidding on its low .99c initial starting price. That person of course, was me – and I had only been in Melbourne for about 4 days. 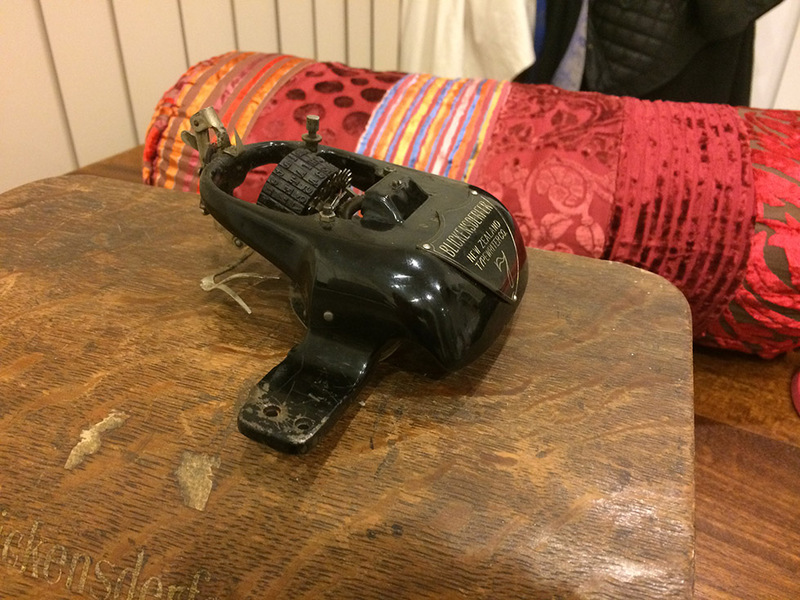 The machine was located in the suburb of St Kilda – a place where I had spent probably far too much of my late teens and 20’s and I knew the ground well. The seller was a gentleman living in a million-dollar mansion and an email address that belonged to the local yachting club. He was a very pleasant guy who freely admitted that he didn’t know what the machine was really worth, and apologised for the currently jammed up state that the machine was in. “I just wanted to get it out of the way, really” he told me. “It has been on display on our sideboard for years, but my wife redecorated recently, and we just didn’t have space for it”. Fair enough I shrugged – knowing that the cash I had in my pocket as we talked in the polished concrete and glass foyer of his building was probably an inconsequential amount to this guy. I gave the machine a push and a prod to see if I could get some life, but it was indeed as jammed as had been described. My heart jumped with excitement as I stood there holding the machine, eager to explore the innards of a blickensderfer – and the interesting experience that would no-doubt come from it. I handed the cash and we parted ways. I felt decidedly poor then – particularly as a woman wearing Prada walked through the door and passed us as without a hint of acknowledgement as I detailed to the guy about how it wasn’t actually made in New Zealand – despite the name emblazoned on the front of it. I walked out of the building and looked down the street at the Espy Hotel, a place where I had probably spent over the bar enough to buy dozens of these machines. I sat the Blick on the table and home and almost immediately started to examine the machine in the hope of diagnosing the problem. Soon I had the head piece off and I was quickly learning that these typers were designed to be easier to access and service than most other typewriters I had ever come across. Unfortunately the head was jammed tight – even when released from the bottom half of the machine, and it wasn’t immediately obvious where the problem was. Decapitated – The head of the Blickensderfer 7. It took me a little fiddling, oiling and a lot of cleaning before life returned to the head again. And when I bolted everything back on it still didn’t work. There were yet two other problems that confronted me before I would bring this machine back to life again. 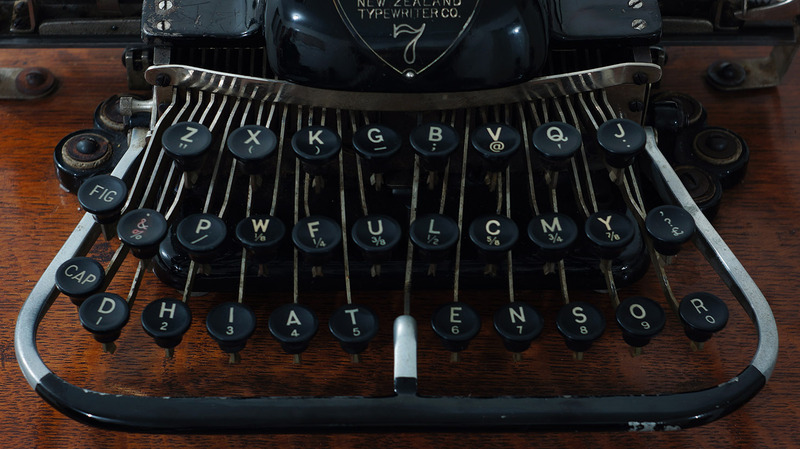 Suffice to say, I now have quite a strong idea about how these typewriters work now. And it certainly was worth it, as mechanically this blick is now a first-rate specimen and is ready to type for another 100 years. 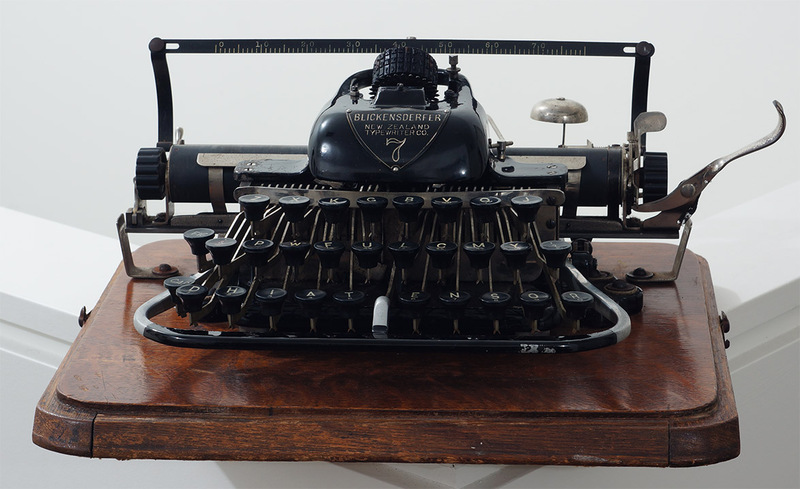 Another thing that excited me about this machine was that it has a ‘Scientific’ keyboard – a layout that was researched at the time to be the most efficient typing layout possible – with the front letters supposedly representing the top 70% most used keys. However, it was on a machine that… well… would never win any speed competitions due to the higher kinetic energy requirements that this machine has for each key press. Scientific Keyboard – AKA DHIATENSOR keyboard. The first time I ever used such a layout was on the ‘Blickletric’ – an IBM Selectric that had been converted by Peter Brill for use at the Oz Typewriter exhibition that I went to in Canberra in 2012. I started to get to grips with the keyboard fairly quickly, and have ever since then wanted to challenge myself on an real Blick with this keyboard. The Blickensderfer is an incredible machine. The characteristics of the design are subjectively beautiful to some, wondrously ingenious to others. And believe me I was damn happy to get hold of this guy at a price that seems almost absurd for a Blick these days. Especially with a complete case, with and intact leather handle. Now that it is decidedly unjammed. Blickensderfer 7 – New Zealand edition. However there were a few more surprises in store for me with this machine as yet but more about that later. I have another story to tell as yet. A week or so after I bought this magnificent Blick, something else that is rarely seen grabbed my attention on Ebay. 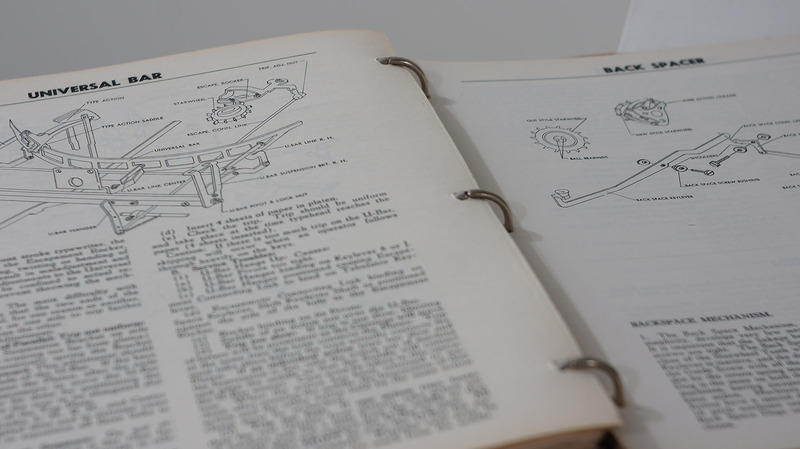 The 1948 Ames Typewriter repair manual. This was another piece of history that had somehow made its way to Australia from New Zealand. Inside the front cover is the original owner’s address – which is also diligently typed onto several other pages in the guide, just like I used to do in my high school years in case someone stole my text-books and tore the front page out to hide the evidence. I bought this machine off a woman that lived a few suburbs away from my in Ivanhoe. It took about two weeks of email ping-pong before we were both able to catch up, as both of us worked in medical with consistently inconsistent hours. It turned out that she was a phlebotomist that worked across several sites. She had moved across from New Zealand to Australia a couple of years ago, and had brought with her this book – which she had picked up from a flea market. 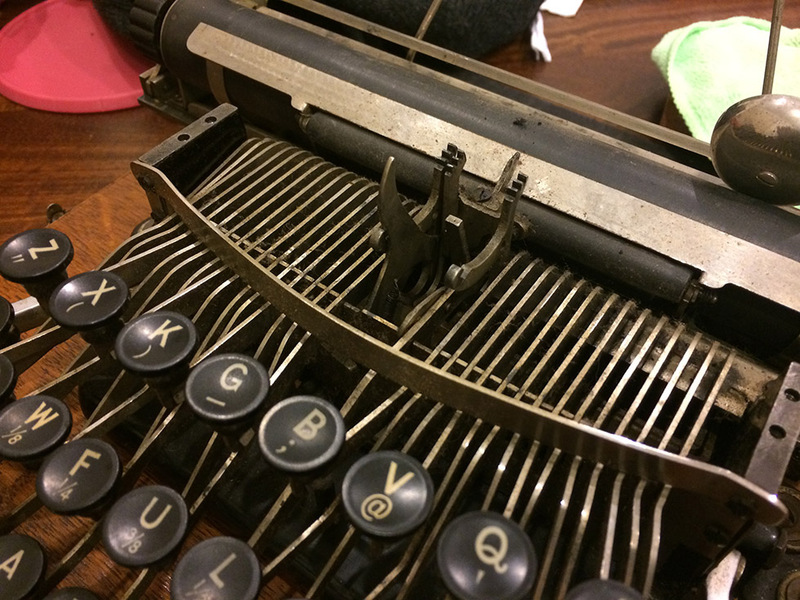 She’d also brought two typewriters, one of which was bought by Natalie Tan over at the Nats Lap Taps blog. I collected the book and Natalie’s typewriter together. 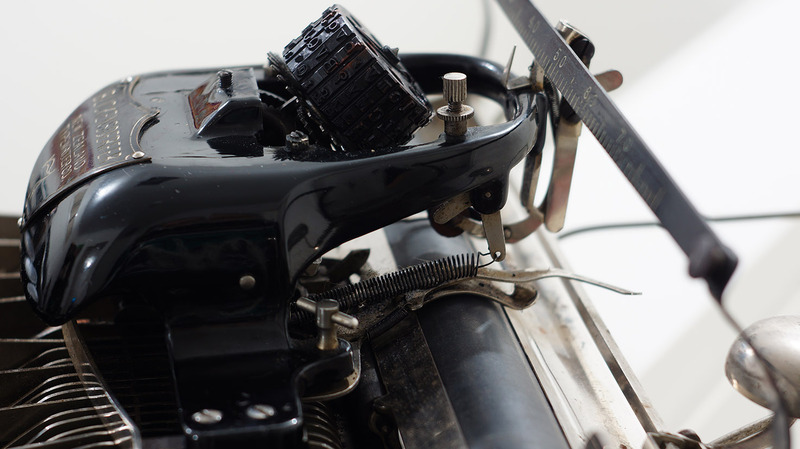 The first half of this manual is 90% identical to the ‘Navy Typewriter Maintenance Guide‘ that has been readily available for a while now around the interwebs for all and sundry who are interested in repairing typewriters to use. 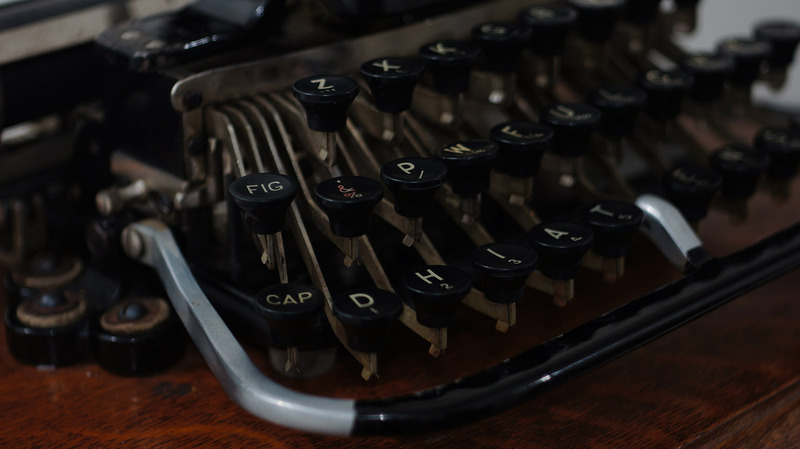 However this guide goes a step beyond that and has extensive detail about resetting typefaces, fixing noiseless desktops and mixing chemicals to clean typewriters and remove rust. Some of that stuff is glossed over in the navy manual, but this guide even goes to the extent of detailing how to construct a functional workshop and workshop equipment such as infra-red baking ovens for paint work. It even has copies of sale, loan and maintenance contracts ready for a new business owner to start running his own show. And to add to the fun, it also has addendum sections for desktop typewriters that weren’t originally featured in the manual; before busting out into a whole section on portables. Just to show off, the guy who originally kept this book made damn sure he had everything he could get his hands on. So this version of the manual also has an extensive guide to maintaining adding machines. And yes… This book has a date with a scanner – just as soon as I can find one that I can use for about a week. I could feed this book into my scanner at work, which would easily smash through the job matter of minutes before producing an easily emailed PDF – ready to go. However, the pages in this guide are a little fragile, and I dare not risk any of this guide becoming fodder for the modern printer-scanner curse: the dreaded ‘paper jam’. Stay tuned for more in part 2, as I delve into the hidden surprises found in the Blick, and the origins of both of these items. Along with what has become of their homes since they left New Zealand. ← A Visit To The ‘Sticky Institute’. That’s an awesome find, congratulations. 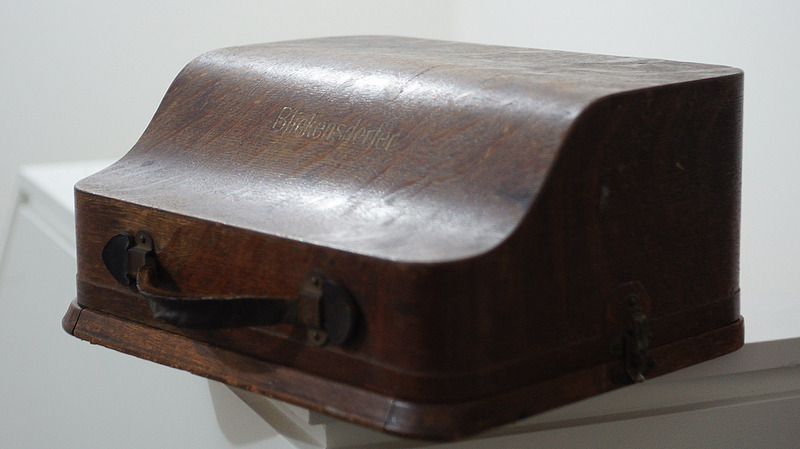 The Blick is such an interesting machine, and I’ve always been fascinated by the wooden case. They certainly are! That Wooden case sure does have a lot of charm. Great little typewriter. Congrats on the Blick. They are wonderful machines. 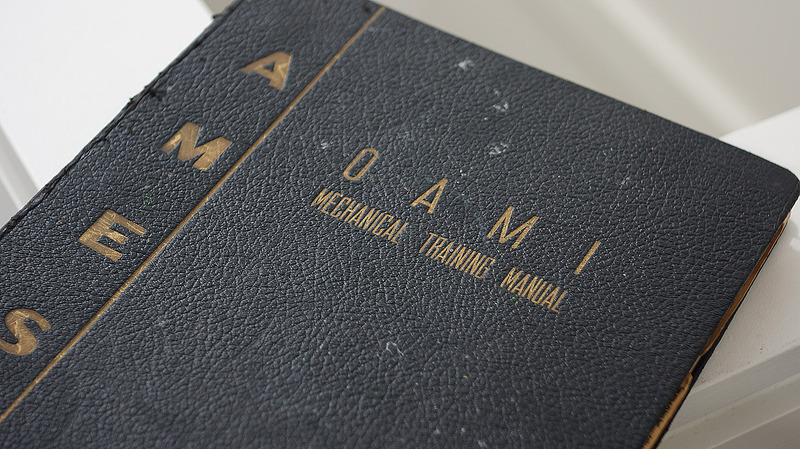 I have a version of the Ames manual minus the portable and noiseless information. I look forward to your scan! Thanks Richard. I really love the artistry of these machines. As for the ames manual, I did spot that! Sorry, I should have made a link to your page. I’ll put that up soon. I’ll also send you a scan when I’m done. Ahhhhhhh…. You know it has a whole bunch of lists. What I like to call ‘The Centrefold’. Sadly, there doesn’t appear to be an age guide in this one. I’m so close to considering on actually trying to get a Blick or Hammond…still on the fence about that. I’ve used a Scientific keyboard Blick and it actually wasn’t that hard to get used to (for typing a few sentences). Noiseless standards are an absolute monster. They jam tight with only a little dirt, and if you get rust into them you’re in a world of hurt. I do like both the Blick and Hammond machines. Both because they are so visually interesting. I’d also love to get a hammond. Ha ha ha! Good one. Come type on it one day! Great! I’m definitely up for a Melbourne type-in sometime next year! Yes Scott, once you get it freed up you can see what an ingenious little machine Mr George B invented. Way ahead of its time , looking back. Cannot wait for your scanning to commence. Thanks a heap John. Yeah, they are definitely wondrous little machines. I really do wonder how the electric blick may feel to type on. Wow. Amazing buy. You’re lucky to buy it. I would have definitely have pressed the BUY NOW button if I had been in Melbourne at that time. Thanks! It really was a great buy. I’m very happy with it.